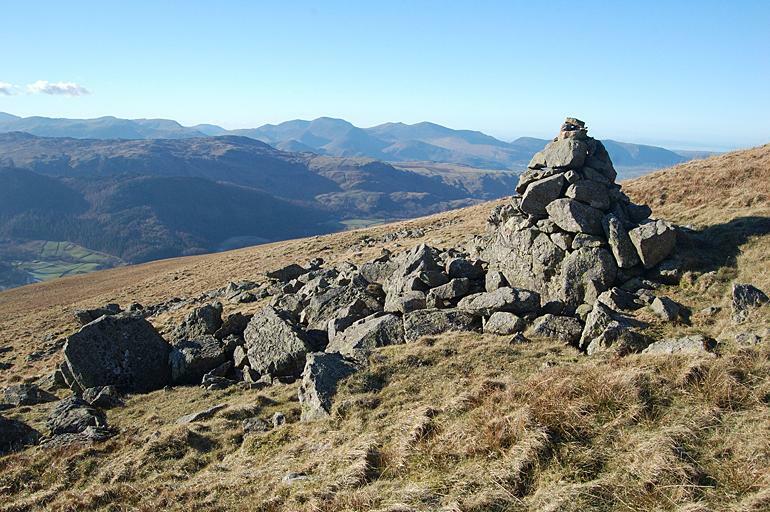 The purpose of this solitary cairn on the slopes of Great Dodd is a mystery to me. It can't be seen at any great distance and there is no line of cairns leading to or from it. On the horizon from the left are: the descending slopes of Pillar, with High Seat in the middle distance; Dale Head; a glimpse of the top of High Crag; High Stile, with Hindscarth in front; Red Pike; Robinson; Great Borne; Bleaberry Fell in the middle distance, with Knott Rigg behind it; Whiteless Pike; Grasmoor with a diminutive Cat Bells in front of it; Eel Crag; Causey Pike; Coledale Hause; Sand Hill; Hopegill Head; Grisedale Pike; Whinlatter; and Lord's Seat behind the cairn. Smaller version of this picture.